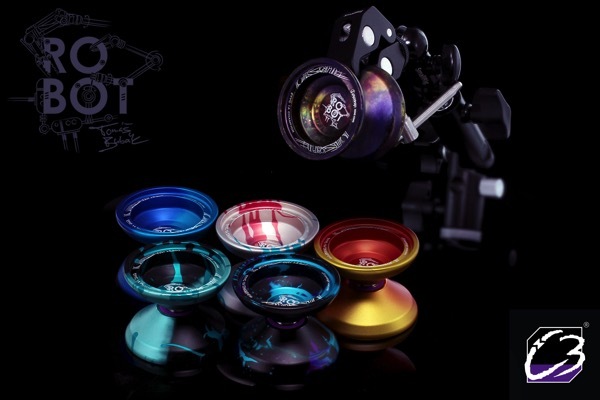 YoYoExpert Blog & Yo-Yo News – New C3yoyodesign Robot & Token! New C3yoyodesign Robot & Token! The Robot is a nice full sized design with a strong stepped concave v-shape design and a wide catch zone. It has a really rim heavy weight distribution that gives it an aggressive feel, strong spin, and a beautifully solid presence on the string. It maneuvers easily through tight combos and the v-shape design allows the robot to move as fast as you can push it! The Token delivers some of the best performance you can find in a mono-metal pocket sized throw. It has a fast agile feel on the string with plenty of spin power and stability to get through long combos. The v-shape profile opens up the catch zone to make risky whips and hops a breeze while the full size C bearing and 19mm pads offer a reliable level of response. The most notable thing about the new Token is the cup design – C3 did away with the old center nub and replaced it with an amazing fingerspin cup!